The hardest part about switching to a plant based vegan diet is figuring out what to use for vegan substitutes. Once you change your mindset and get used to the different ingredients, you’ll find using vegan substitutes will become second nature. Here is a vegan substitutes guide that’ll give you an idea of the options you have for common ingredient substitutions. Store-bought processed foods are great if you’re transitioning to a vegan diet from the Standard American Diet (SAD), but they aren’t as healthy as whole plant foods. As you move along your path of veganism, please consider adopting a whole-food plant-based (WFPB) diet rich in fruits, vegetables, legumes, nuts, seeds and whole grains. 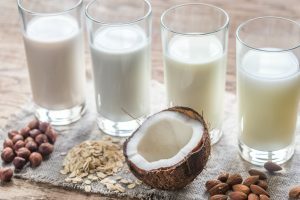 Milk is the easiest thing to replace with vegan substitutes because we now have so many non-dairy milk alternatives, including soy (my least favorite), rice, almond, cashew, hazelnut, coconut, pea-based and hemp. You’ll find non-dairy milk stored in the milk cooler next to the dairy milk. You’ll also find boxes stored on the store shelves, but those don’t taste as good to drink, for some reason. They seem watery to me. These non-dairy milks have a creamier texture like whole milk, but they lack all the cholesterol, growth hormones, antibiotics and pesticides that you get from cow’s milk. Non-dairy milk is also fortified with calcium so you’ll still get your calcium needs met. Most brands offer both sweetened and unsweetened varieties. I encourage you to give the unsweetened a shot first because it tastes more like regular milk and you won’t get used to the copious amounts of added sugar. I used to drink the sweetened non-dairy milk before I switched to a vegan diet, but now it’s far too sweet for me. You can also make your own milk at home, which is much cheaper. Brown Rice Milk is super easy to make, and costs a fraction of the store-bought brands. By going vegan and removing most of the added sugar and added fat from your diet, you’ll find that your tastebuds become more sensitive and you won’t like a lot of the things you previously couldn’t live without. Butter is easy to substitute with vegan alternatives. 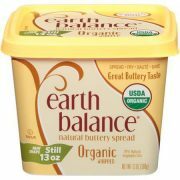 Our favorite brand is Earth Balance. The Original flavor is best for your morning toast, but the other flavors are good, too. You can cook with these just like you do with real butter, and you can even melt it and pour it over your popcorn. You can also substitute butter with oil or vegetable shortening in some recipes. Even though these vegan substitutes lack cholesterol, they still have a high fat content, so if you’re trying to lose weight or lower your cholesterol, you may want to use something else. Instead of vegan butter on toast, we like to just use Cashew Butter or jam all by itself. Jelly is usually made with gelatin, which isn’t vegan (see below) so opt for jam or spreadable fruit without gelatin. If you want to grill a sandwich without oil, try basting your bread with aquafaba (the juice from a can of chickpeas). This works great as a whole-food alternative. We even used it as a marinade for our Oil Free Grilled Plantains. For potatoes and other savory dishes that call for butter, we use salsa or hot sauce. Sometimes we just pile some leftover stir fry or beans on them. Potatoes don’t need butter. For popcorn, try fresh squeezed lime juice! We learned this trick in Ecuador, where it’s common practice to squeeze lime on popcorn. And no, it won’t make your popcorn any soggier than melted butter does. I used to miss cheese after switching to a vegan diet, but not anymore. Knowing how bad cheese is for my health and the horrible cruelty that goes into making it, I don’t miss it. There are several plant based vegan cheeses available, and they’re getting better all the time. 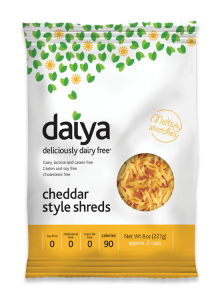 Daiya makes a variety of cheese alternatives that are ok. We used their shredded cheddar and mozzarella on our homemade Veggie Pizzas before we went oil-free and it tasted great. We especially like their vegan cheesecake found in the frozen dessert section, and their frozen veggie pizza is pretty good for a frozen pizza. We’ve tried some of the cheese block alternatives, but the texture is a little hard to overcome. If you’re familiar with the texture of Velveeta, it’s like that. There are also a lot more nut-based artisanal cheeses available now. These have more of a high-quality cheese flavor and texture, along with a higher price. All of the cheese substitutes are high in saturated fat and most are made with oil so if you’re trying to lose weight or lower your cholesterol, it’s best to avoid them. In addition to milk, nearly every other type of dairy product now has vegan substitutes, including yogurt, ice cream, sour cream and cream cheese. You’ll find most of these either in the vegan section, or next to their regular dairy counterparts. You can use Coconut Cream for most of your cream substitutes. 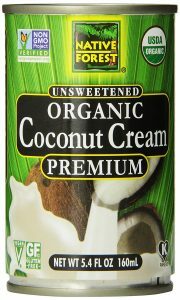 It’s thick and creamy just like real cream, but without the awful health consequences. And once it’s cooked up in a recipe, you can’t tell the difference. You can make your own cream cheese without much effort, such as our Cashew Cream Cheese, which has a similar texture and flavor as regular cream cheese. Many of these dairy substitutes are loaded with saturated fat, which will raise your cholesterol and greatly increase the calorie density of your food so either skip them entirely or use very sparingly. There is (currently) no substitute for fried eggs, but you can replace eggs in just about every other recipe, including scrambled eggs. I made my Tofu Scramble for my mom and for Amelia’s family who are vegan diet skeptical and they loved it. 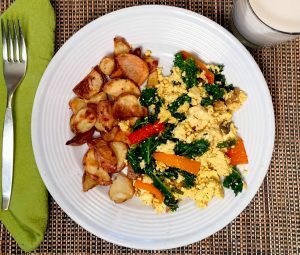 Crumbling the tofu and adding turmeric gives the Tofu Scramble a similar texture, color and flavor as real scrambled eggs (without the cholesterol and cruelty). I actually prefer this over real scrambled eggs, which are often undercooked or overcooked. Indian or Himalayan Black Salt (it’s actually pink) is another vegan trick ingredient to simulate an egg taste and smell. It contains sulfur and actually smells like hard boiled eggs. We ordered Himalayan Black Salt on Amazon and really like it. Just replace the 1/2 tsp of regular salt in your Tofu Scramble with 1/2 tsp of black salt to give it that egg aroma. NOTE: Indian Black Salt is different than Hawaiian Black Salt or Black Lava Salt so you can’t interchange the two. We found Hawaiian Black Salt at Whole Foods, but we had to order the Himalayan Black Salt on Amazon. You can also use chickpea flour mixed with water or vegetable broth to create a creamy batter that can be used to make scrambled eggs, omelettes or quiche. In baking, eggs are used mostly as a binding agent, so it’s easy to replace them with any number of things that will also bind the ingredients together, such as flax eggs, applesauce, fruit puree or chickpea flour. Amelia replaced the eggs and oil in our Brownies recipe with black beans and they taste amazing! Believe it or not, the animal ag industry figured out how to make use of the leftover bones of slaughtered animals: sell them to the sugar industry. Most non-organic sugar in the United States is processed with bone char to give the sugar it’s signature pure white color. However, in most parts of the world, this isn’t a common practice so sugar has a tan-ish color. You may have seen “raw sugar” before in hip restaurants. It’s that color. 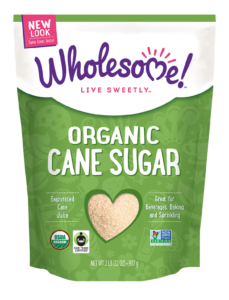 The best way to avoid using sugar made with ground up animal parts is to buy organic sugar, which isn’t allowed to be processed with bone char. 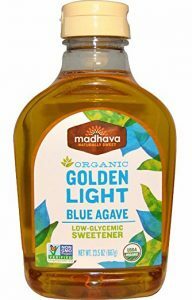 Stevia, U-Sweet, agave and maple syrup are also good substitutes. The reason why vegans don’t eat honey is because of the way the bees are treated. The queens are often relieved of their wings so they can’t fly away. It also takes countless trips for bees to make enough honey to feed their babies, so when we take their honey, they’re forced to make even more so their offspring won’t starve. Essentially, bees are forced into slave labor to protect their young. That’s certainly not very humane. Agave nectar, maple syrup and date paste are good vegan substitutes for honey. They have a similar texture and they’re sweet, but they don’t taste like honey. If you can find it, Bee Free Honey made from apples is supposed to taste like honey with a slight apple aftertaste. We haven’t found it yet in stores near us so we can’t attest to the taste. Did you know that gelatin is an animal by-product made from boiled skin, tendons, ligaments, bones and hooves. And we’ve been eating this disgusting stuff our whole lives! Gross!!! Luckily, there are plenty of vegan substitutes for gelatin, such as agar powder, carrageen, vegetable gum and fruit pectin. Agar powder dissolves in water just like gelatin. Carrageen is better for getting the pudding texture. Xanthan gum, guar gum and locust bean gum are types of vegetable gum that you often see in ingredient lists on pre-packaged food. Pectin is often used to make jams and jellies. If you’re highly dedicated to eliminating gelatin from your consumption, I have some bad news for you. Most of the lower-end supplements contain gelatin. I have no idea why since most supplements are dry and hard, but I’ve had a difficult time finding any that don’t have it. The animal ag industry is really good at slipping animal products into everything. There are vegan substitutes for virtually every kind of meat now. Tempeh and seitan are the original vegan substitutes for meat, but they take a bit of getting used to. They’re their own thing and they taste great in the right recipes, but there are more authentic alternatives. Lentils are the healthiest ground beef substitute and green or brown lentils work the best. You can boil them on the stove or cook in them in a pressure cooker until they’re very soft, then mash them up and use them in place of ground beef. Lentils don’t have much flavor of their own (neither does ground beef) so just flavor them with your favorite herbs and spices. 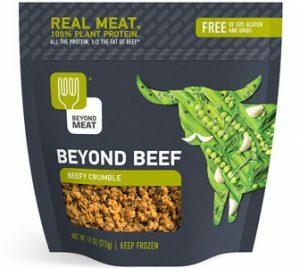 Before we went oil-free, we used Beefy Crumbles from Beyond Meat as a vegan substitute for hamburger. The flavor, color and texture are nearly identical. If you add it to spaghetti sauce or lasagna, you can’t tell the difference. We made our Overnight Lasagna for Amelia’s parents and for my parents, and they both said it was the best lasagna they’ve ever had. There are a dozen or more types of vegan substitutes for hamburgers in the frozen food section that taste delicious. Some look and taste more like veggie burgers, while others taste like real hamburgers. The new Beyond Burgers from Beyond Meat even bleed beet “blood” and taste so much like a real hamburger that it’s almost too real! Most of these are really high in fat and saturated fat, so they should be a rare treat, not a daily addiction. We eat Gimme Lean Veggie Sausage from Lightlife as a great vegan substitute for sausage. It looks and smells just like sausage, with a slightly milder taste. If you slice it, fry it in a skillet and serve it to a vegan skeptic, they won’t know the difference. Jackfruit is a favorite of mine. It comes from a real fruit that’s been consumed in Asia for centuries (maybe longer). It has the texture of meat but not much flavor of its own. That means you can season it however you like. 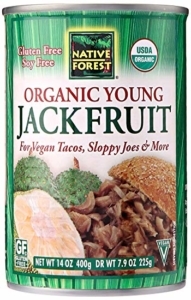 Some stores also sell prepackaged jackfruit from The Jackfruit Company that tastes delicious! Check your frozen food section for a meatless “meat” section. There are all sorts of prepackaged options for fish, chicken, pork and more. BE CAREFUL: Most of the MorningStar Farms products are labeled as “meatless” and they’re stored next to the other vegan substitutes in the frozen food section, but they contain eggs and dairy so they’re vegetarian, not vegan. There are vegan substitutes for bacon, but they taste nothing like bacon. They might be shaped like bacon, but that doesn’t make them bacon. This is one substitute that has a long way to go. However, if you use an all natural Liquid Smoke in your recipes that call for bacon or bacon drippings, you’ll get the bacon taste without using bacon. That’s because bacon only tastes like bacon because it’s bathed in Liquid Smoke during the curing process. Most Liquid Smoke products contain molasses, which is only vegan if it’s organic because non-organic molasses contains non-organic sugar which is most often processed with animal bone char. Look for an all natural Liquid Smoke that doesn’t contain molasses.